Cutting tools like box cutters and utility knives are found in just about every industrial setting. But useful as they are, cutting tools are inherently dangerous. Every EHS manager is tasked with how to mitigate the hazard posed by these tools. Cutting tool manufacturers have done their part by designing safety knives. Traditionally, this has meant creating handle features that minimize blade exposure. Gloves also help, but many employees take issue with how cumbersome they can be. The extra step of having gloves on hand and actually using them also poses an inconvenience that can result in employees foregoing this important safety protocol. Even with these steps, however, the root of the problem remains: the dangerous blade is ultimately what causes lacerations. Slice is the only company to offer safety handles and safety blades. Slice blades are made of an advanced ceramic—100 percent zirconium oxide, to be specific—and feature a proprietary grind that makes the cutting edge safe to the touch. Other ceramic blades and traditional metal blades are overly sharp out of the box. For metal this is particularly necessary because the material dulls relatively quickly. Blades are at their most dangerous when they are overly sharp and when they’re too dull. Another great advantage the Slice ceramic blades have over metal counterparts is that they last up to eleven times longer. This means better value and fewer blade changes. Handling a blade is a high-risk situation for cuts; the less often you do it, the better. When you do have to change a Slice blade, here’s one more upside: there’s no need to use a sharps container to dispose of the old one. Slice makes rounded tip utility knife blades and box cutting blades for another level of safety. But if you do need a pointed tip, Slice has those, as well. 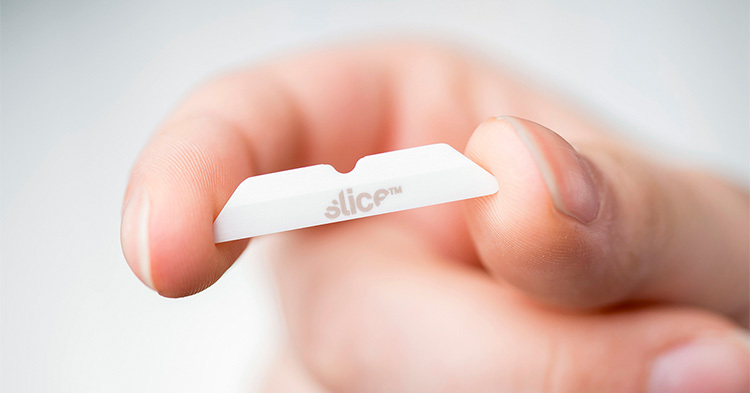 At Slice the goal is to create the safest safety knife possible. We work with world-renowned designers to reassess every aspect of achieving this goal. In addition to offering safety blades, Slice offers safety handles and ergonomic designs. Traditionally, safety handles have come in two types of design: fixed-retraction and auto-retraction. Fixed-retraction handles have a slider that the user depresses and slides to fix the blade in an exposed position. After use, the reverse action replaces the blade back into the handle so it poses no laceration threat. An auto-retraction handle requires that the user keep the slider engaged to keep the blade exposed. If the user stops engaging the slider, as would happen if they dropped the cutting tool, the blade automatically recesses into the handle. This adds a level of safety. Slice offers both options for its box cutters and utility knives. For the latter, Slice also offers a third design that ups the safety game: a smart-retraction handle. Similar to the auto-retraction model, the user must keep the slider engaged to keep the blade exposed. Additionally, the blade must stay in contact with the material it’s cutting. So, for instance, if the utility knife slips during a cut but the user still has the slider engaged, the blade will still return into the handle. Another unique feature of Slice’s smart-retracting utility knife is the Ergo Pull™ slider: it is engaged by pulling the slider instead of pushing. Third-party testing shows that allowing the user to slide and cut in the same direction reduces fatigue in the hand, arm, and forearm. 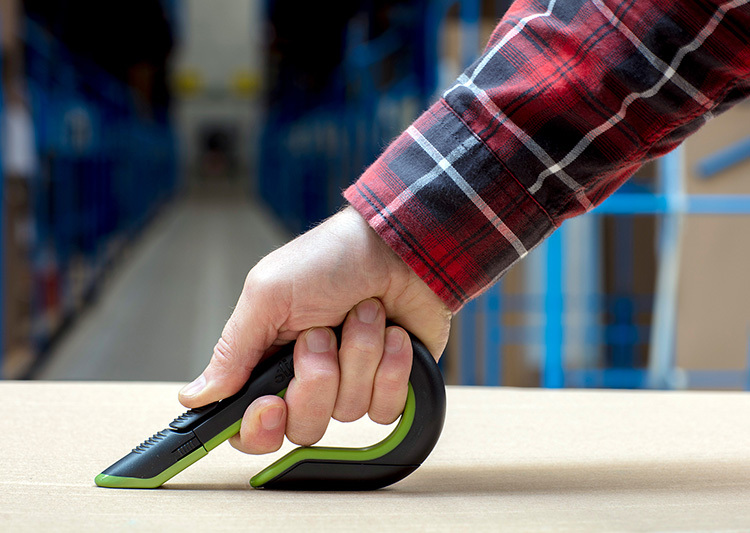 The Slice box cutter features a unique, award-winning J-hook design. The wrap-around style of the handle provides a comfortable grip and easy cutting action, while also protecting the hand from potentially hazardous objects like nails or staples. The handle also features storage for a spare blade. And no tools are required to change the blade. Also, conventional box cutters typically expose the blade up to an inch. The Slice box cutter blade is exposed just enough to cut through single- or double-walled corrugated cardboard. This saves merchandise in the box from being damaged. Manufacturers and retailers lose millions of dollars each year to items ruined before they’re even out of the box! 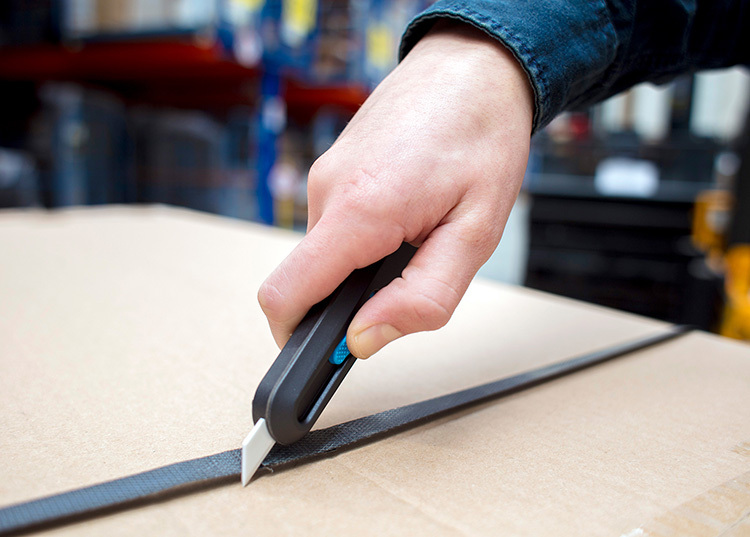 Box cutters are excellent for making long, straight cuts, as is required when opening or breaking down a cardboard box. The Slice utility knife is more robust and allows for more blade exposure. This makes it good to use for deeper cuts in tougher materials. It’s also more maneuverable. Slice handles are made of glass-filled nylon, which is lightweight but highly durable. They’re made to last in the non-delicate worlds of warehouses, factories, and other industrial environments. One client went so far as to test the box cutter’s mettle by running over with a forklift—with both sets of wheels. No problem! The tool kept on cutting. The goal at Slice is to spread the safety message, by creating safer cutting tools and writing weekly posts for our Workplace Safety Blog. As regards our tools, however, you won’t realize their benefits only by reading about them. You need to use them. The proof is in safer cutting experiences, and we hear about them daily. Over half of the Fortune 1000 companies use Slice safety tools. And several industrial businesses who have switched to Slice have tracked their success. 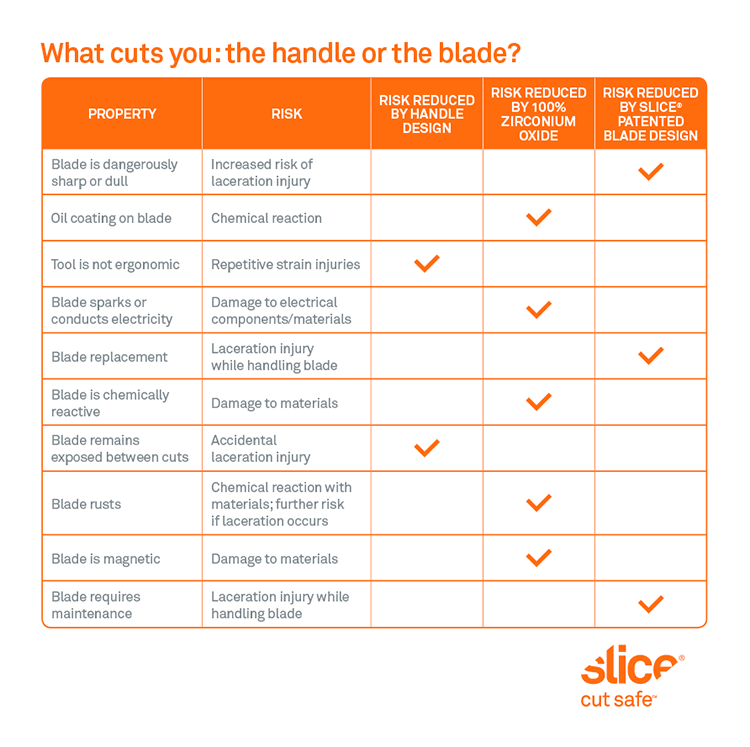 International Paper, Flowserve, and NBCUniversal, among many others, have made Slice a part of their safety culture and have experienced a reduction or total elimination of lacerations since making the switch. We love to receive feedback, and welcome you to share your Slice safety story. TJ Scimone founded Slice, Inc. in 2008 with an eye to creating the safest cutting tools. The result is a unique line of tools, all of which are ergonomic and feature finger-friendly® blades.